A complete listing of every weapon, ammo type and accessory available to the Car Wars, Car Wars Tanks, or Aeroduel duellist, all under one cover? Impossible! Your old Uncle Al is back with a vengeance! 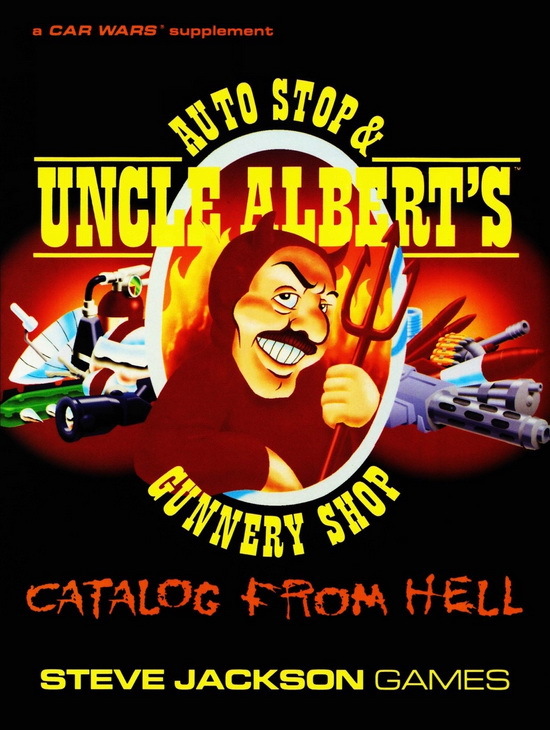 This is the ultimate Uncle Al's, with the most up-to-the-minute versions of hundreds of state of the art weapons and accessories – all at rock bottom prices! Everything from the Car Wars Compendium 2nd Edition, everything from Boat Wars, everything from Aeroduel, everything from Car Wars Tanks! 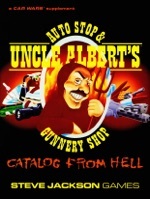 Plus loads of neat stuff from the earlier Uncle Al's Catalogs and issues of ADQ! But Wait – THERE'S MORE!! Uncle Al's Home Shopping Club! New, advanced jumping rules for Car Wars! You can't afford to pass up this catalog! Your survival on the roads of the 2040s depends on knowing what's out there – and having the best, most modern equipment on your own vehicle! Drive Offensively . . . with Uncle Al, the Duellist's Pal!